We are delighted to have had the support of many people during the past years without which the Irish Ladies Flyfishing teams and committees would have found it difficult to continue. The team members and aspiring team members presently pay the considerable costs of training and contribute towards the cost of competing Internationally while at the same time assisting the committee in fundraising to keep the National Association inplace to support up-coming and interested anglers of all ages. We are registered under Games/Sports Exemption Section (Section 235, Taxes Consolidation Act, 1997 from Income tax/ Corporation Tax) ref. G.S. 535 Irish Ladies Flyfishing Association. If you would be interested in sponsoring the Irish Ladies team please do not hesitate to get intouch. All help is greatly appreciated and in return we could advertise your company on the website through banners and links to your website perhaps. To discuss sponsorship please get intouch with any of the current committee. Woodford Flyfishery Carrickfergus. Straid Fishery, Ballyclare. Brian Kerr. Julie Gerry. Madeleine Kelly. Jenny Casey. Susan Brown. Stephanie Troy. Emerger Tackle. Rathcon Fishery. Portlaoise Angling Centre. Barrio Flylines. Southside Angling. Linwoods Ltd. Renvyle House Hotel. 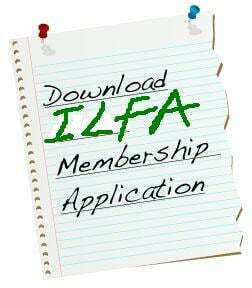 Laune Salmon & Trout Anglers Association. Dorrie Gibbons. Susan Brown. Failte Ireland, Diagio, Vintners Federation of Ireland, Beedys Bar, Dungloe, Climb 8, Foxford, Co Mayo, Patsy Tracey, Enniskillen, Central Fisheries Board, Dublin Tourism, Gormanstown & District Anglers, Ballyhass Lakes, Michael Twohig - Supervalu Kanturk, Dan Dennehy, Angling Ireland, Anglers Digest, Irish Distillers Western Beverages Ltd - Galway, Kevin Tarrant (Editor of Killarney Gems), Michael Lenihan - Imedia, Valerie O'Sullivan - Photographer, Riddels, Lisburn, Tayto Ireland, G McFadden & Sons Donegal, Barton Smiths, Susan Randles, Randles Hotels, Lough Lein Anglers, John Buckley, Barney Maloney and Boatmen. Braddels Tackle Belfast; Recreational Angling Ireland; Western Regional Fishery Board, North Western Regional Fishery Board; Ballinrobe and District Anglers Association; Rod Tye Angling Centre; Failte Ireland; Ireland West Tourism and numerous sponsors who have given of their time and experience to assist the ILFA during the International Match; Deirdre Moynihan Web Design. John Paddy Burke, Cory Page. Irish Anglers Digest. Deirdre Moynihan Web design. John Dever, John Paddy Burke, Pat Burns, M. Cosgrove. Aidan McCaffrey. Accountant. Pat Burns of Ireland Angling Swords, Peregrine Rods, John Paddy Burke. Ann Kerrin sponsored a fishing rod for our draw in Rathbeggan. Bill Heritage of Warnants Export and Import Co. Ltd. has kindly sponsored a rod and box of flies. 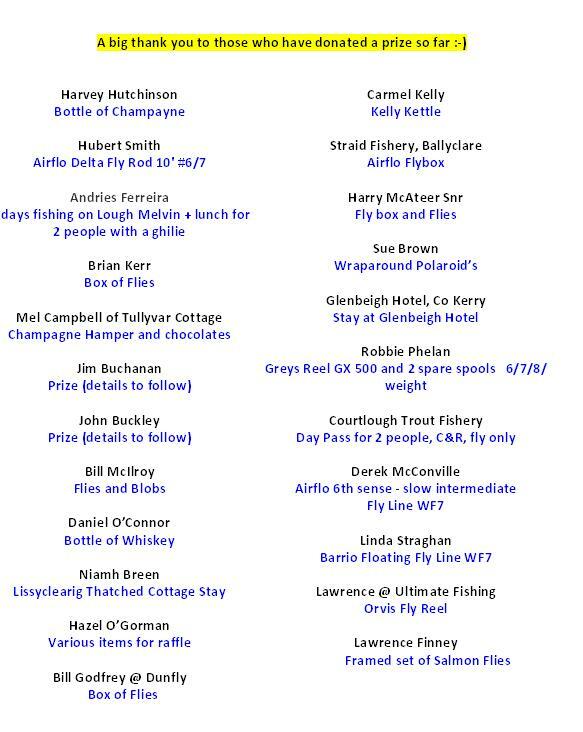 A succesful fundraising draw was held on 24th February in conjunction with Angling Ireland 2002 on ILFA Stand at Cloghran Swords Co. Dublin. Thanks to our sponsors Pontoon Bridge Hotel Foxford, Brendan Begley, Frankie McPhillips, Bert Atkins, Rory Harkin, Julie McGeever, Moira Cosgrove and Pat Burns. Ennis Information Age Town. Co. Clare. Mr. Jim Finlay, Lisburn, Co. Antrim. Ms. Carmel Keenan, Robertstown, Naas Co. Kildare. Healy's Hotel Pontoon, Co. Mayo. The Lake House Cloonee Lakes, Kenmare Co. Kerry. River Bann Co. Derry. (Private Waters). Ashford Castle Cong, Co. Mayo. Rory Harkin's Fishing Tackle Temple Bar Dublin. Patrick Cleere & Son Fishing Tackle, Temple Bar. Pat Nolan of Premier Angling Supplies, Nenagh Co. Tipperary. Tuck's Angling Supplies, Oughterard Co. Galway. The Kelly Family, Newtown- Cloghens, Ballina Co. Mayo. A draw for Sponsors was held and Sherry Fitzgerald was nominated Main Sponsor for that year. 1998: Main Sponsor: Lassanger Aquagroup. There were a number of other supporters. 1994 to 1997: Main Sponsor: The K Club, Co Kildare. 1991-1994: Anne Geary and Pontoon Bridge Hotel. Bord faillte and a number of supporters.